Russia Recognizes Independent Crimea; U.S. And EU 'Stand Firm' With Ukraine : The Two-Way President Obama says the U.S. will not recognize Crimea's moves to split from Ukraine. In Moscow, President Vladimir Putin signs an order recognizing Crimea as an independent state. A pile of the votes cast Sunday in Simferopol, Ukraine, the regional capital of Crimea. Updated at 3:10 p.m. ET. Russia has officially recognized Crimea as a sovereign independent state, after President Vladimir Putin signed a decree to that effect late Monday, according to a release from the Kremlin. The decree takes effect immediately, naming "the Republic of Crimea, in which the city of Sevastopol has a special status." Russian-backed RT News reports that Crimea's parliament on Monday "unanimously voted to integrate the region into Russia." Putin is slated "to address a joint session of parliament Tuesday where he could announce that Russia is annexing Crimea," NPR's Michele Kelemen reports. The U.S. and its European Union allies are "going to stand firm in our unwavering support for Ukraine," President Obama said Monday as he again condemned "Russia's decision to send troops into Ukraine" and said the U.S. will not recognize Crimea's bid to split off and join the Russian Federation. Obama also confirmed reports from earlier in the day that the U.S. has joined the EU in expanding the sanctions on some Russian and Crimean officials who stand accused of undermining the sovereign integrity of Ukraine. If Russia continues to intervene in Ukraine's affairs and take steps that might lead to the annexation of Crimea, it will only "further isolate" itself from the rest of the world community, Obama said. The president also repeated that there is "still a path to resolve this situation diplomatically," which he said would include "Russia pulling its forces back to their bases" and the presence of international monitors in Ukraine. Obama's words followed Sunday's referendum in Crimea on whether to split from Ukraine and join the Russian Federation. Officials there say the referendum was overwhelmingly approved. As you can see in our original post (below) and earlier updates, however, there's evidence that some Crimeans either boycotted the vote or were intimidated by supporters of the referendum. Also Monday, the former U.S. ambassador to Russia told NPR's Robert Siegel that Russian President Vladimir Putin's "most important foreign policy objective" has been derailed by events in Ukraine. Michael McFaul, who left the ambassador's post in Moscow last month to return to his teaching post at Stanford, says that when pro-Russian President Viktor Yanukovych of Ukraine fled his country, that threw into doubt Putin's plan for a "Eurasian" economic zone, including Ukraine, to compete with the European Union. Now, McFaul said, "I think he's [Putin] lost Ukraine forever. He may have won Crimea, but he's lost the res of Ukraine. I don't think there's any chance that they'll be interested in joining his Eurasian economic union." We updated this post with McFaul's comments at 2:15 p.m. ET. More from the conversation with him is due on Monday's All Things Considered. Click here to find an NPR station that broadcasts or streams the show. Update at 10 a.m. ET. U.S. Sanctions Set. "President Obama [on Monday] imposed sanctions on 11 Russians and Ukrainians blamed for Russia's military incursion into Crimea, including two top aides to Russian President Vladimir Putin. "Obama's order freezes any assets in the United States and bans travel to the 11 individuals named as responsible for the Russian move into Crimea. Among those sanctioned were ousted Ukraine President Viktor Yanukovich and Putin aides Vladislov Surkov and Sergei Glazyev." The wire service is live blogging here. This news follows an earlier announcement of sanctions being imposed by the European Union. Update at 9 a.m. ET. European Union's Sanctions Set. "EU foreign ministers impose travel bans, asset freezes on 21 people linked to Ukraine unrest." "European Union foreign ministers have agreed to impose sanctions including travel bans and asset freezes on 21 officials from Russia and Ukraine, Lithuania's foreign minister said on Monday. ... He added that more measures would follow in a few days, when EU leaders meet for a summit in Brussels. They are expected to expand the list to include more senior figures closer to Russian President Vladimir Putin." Sunday's vote in Crimea has been followed, as expected, by steps within that region of Ukraine to split and join the Russian Federation and moves by the U.S. and its European allies to impose economic and other sanctions on Russia and those Crimeans who have spearheaded the region's breakaway attempt. As we reported, Crimean officials say more than 95 percent of those who voted in Sunday's referendum endorsed the idea of joining the Russian Federation. There were, however, complaints about the vote and some signs of intimidation. 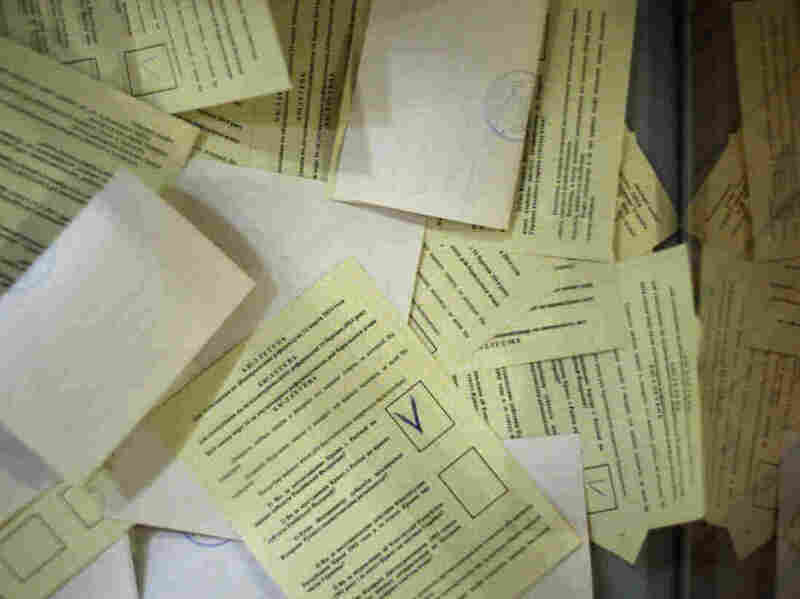 From Crimea, NPR's Gregory Warner tells our Newscast Desk that "many pro-Ukrainian Crimeans boycotted the referendum, saying the ballot gave them no option to vote to maintain the status quo of Crimea as part of Ukraine." He also reports that "activists complained of irregularities — including voting by children and some people voting multiple times. Also, Russian biker gangs and armed self-defense units patrolled polling stations." From the Ukrainian capital of Kiev, NPR's Eleanor Beardsley reports that the interim government there has rejected the vote, saying it is illegal under their nation's constitution. Now, as The Associated Press writes, "the U.S. and its allies in Europe are expected to announce sanctions against Russia, including visa bans and potential asset freezes." President Obama and many Western leaders say Russia has illegally interfered in Ukraine by sending troops into the Crimean region following last month's ouster of Ukraine's pro-Russian president, Viktor Yanukovych. Obama reportedly told Russian President Vladimir Putin again on Sunday that the U.S. will never recognize Sunday's vote. For his part, Putin says he is moving to protect the ethnic Russians in Crimea, which is semi-autonomous, from reprisals by Ukrainian nationalists. However, there has been little, if any, evidence of any such moves by Ukrainians. Meanwhile, steps toward Crimea's split from Ukraine continue. Monday, the BBC reports, Crimea's parliament "formally declared independence from Ukraine and asked to join the Russian Federation." And from Moscow, Russia's Interfax news agency reports that "the independence of Crimea will be recognized by Russia in an inter-state agreement, State Duma Chairman Sergei Naryshkin said." The parliament leader added that Russia will act "swiftly and responsibly" and that he sees no problem with the Crimean officials' request to become part of the federation. As we've previously said, Crimea has been the focus of attention as the ripple effects of the protests that led to last month's ouster of Yanukovych have spread.